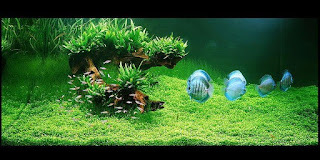 Freshwater aquarium plants are a worthwhile addition to your discus fish tank. In a well planted tank, fish have better habitat, live a more natural life, and appear more comfortable than in an unplanted tank or a tank with less habitat. Though live plants need more care than plastic artificial ones, live plants can be kept with few problems as long as there is plenty of light. Real plants do wonders for aquariums, providing fish with oxygen and habitat. They can keep the water chemistry more balanced, and provide scenery for you, and hiding places for discus fish and other tank inhabitants. Aquarium plants make a beautiful well balanced discus fish tank, as well as a natural home for happy fish. This will make the tank healthier, more stable, and more beautiful. The benefits to aquarium stability and balance are numerous. Aquatic plants produce oxygen through a process called photosynthesis, they absorb carbon dioxide, and they breakdown waste materials. In so many ways, aquatic aquarium plants can increase enjoyment of your fish tank. Live plants can serve as food for aquatic life and also provide fish and fish fry places for retreat. Sometimes plants are not compatible with some fish that will tear them up. Adding aquarium plants is not difficult. Once your tank is set up, you will need to provide plant food, usually a tablet or liquid fertilizer. Ongoing plant care will include some maintenance and keeping an eye out for anything hurting your plants like aquarium snails and other browsers, or plant diseases. With good aquarium design and plant care, you will be rewarded with a lush, beautiful, well balanced aquarium with beautiful plant growth. Before adding aquarium plants there are a couple of things to keep in mind before beginning. One of which is water chemistry. Different aquarium plants require various water conditions. Required water conditions for the plants you want must be attained. You need to be aware of things like ph, hardness levels and lighting levels for each plant. Good substrate is also required in order for the plants to survive. There are clay planters you can get to place your plants in or you can even place some plants directly into the gravel. Experiment a little, and you will find what works. Lightning for aquarium plants requires different levels, usually measured in watts per gallon. If you want your plants to thrive you must pay attention to this measurement in order for photosynthesis to be optimal for plant survival. Carbon dioxide is also required for photosynthesis. Carbon dioxide can come from the fishes respiration process going on in your tank. However, if you have a heavily planted tank, you may want to get a carbon dioxide injector for your aquarium because you won’t be getting enough carbon dioxide from your discus fish. A very important thing to keep in mind before adding plants is to consider fish compatibility. Certain discus fish are not compatible with live plants. Save yourself some money by researching the plants you want to get before buying them so that you can determine their exact needs and whether or not you can meet those needs.